When you think of comfort food, you probably think of a meal that is delicious, but in all reality lacks a bit of style. Salty Sow takes this stereotype and turns it on its head. They take typical gastropub comfort classics and put their own spin on them. The result is a tasty meal with a bit of style. 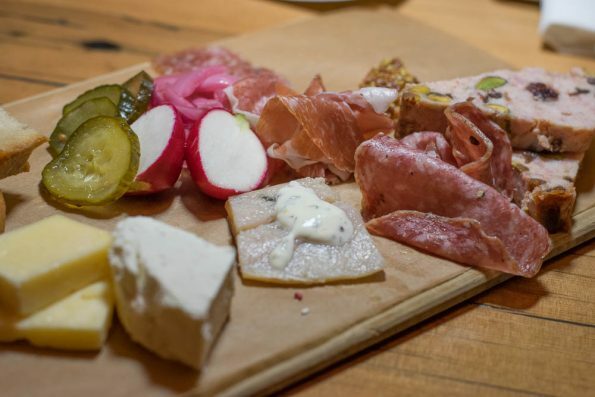 Salty Sow Charcuterie & Cheese Board (A Selection of cured meats and artisanal cheeses with all the fixins and toast)– We have a bit of a soft spot for charcuterie and cheese. So it is no surprise that Salty Sow’s made our list. The selection of meat and cheese is your standard fare, until you get to the pork pate and smoked trout. That’s right, they serve smoked trout on their charcuterie board and its fantastic! We really enjoyed this quirky addition. 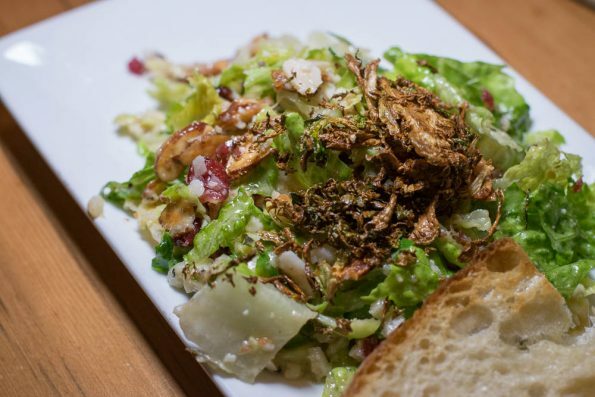 Brussels Sprout Caesar –(A traditional Caesar salad topped with crispy brussels sprouts, candied almonds, dried cranberries, and Parmigiano-Reggiano)– This salad was outstanding! The traditional Caesar dressing (complete with anchovies) had just the right amount of salt to balance the sweet almonds and cranberries, while enhancing the bite of the brussels sprouts. It was definitely one of the evening’s best items. 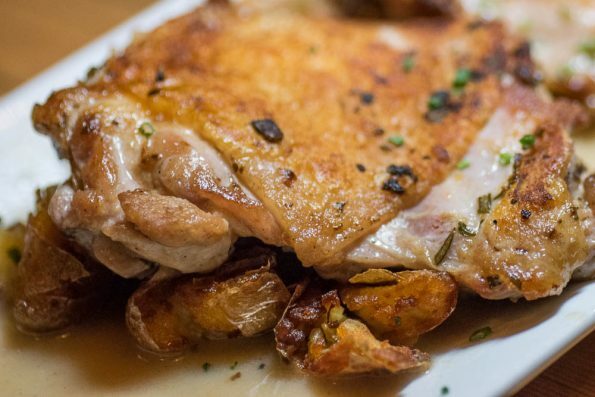 Crisp Chicken Thighs (All natural chicken, fried smashed potatoes, and neck bone gravy)– Seemingly standard comfort food, the Crisp Chicken Thighs at Salty Sow stood out for a couple reasons. First, they are cooked on a plancha rather than a standard grill. Secondly, they still have their skin! Generally, chicken is served skinless because its healthier. These chicken thighs are cooked to crispy perfection and their neck bone gravy is delicious! 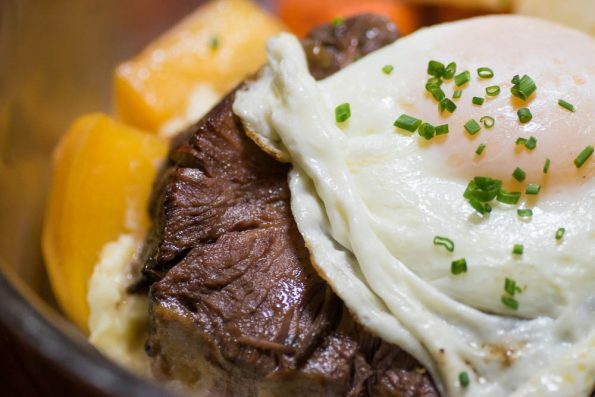 Slow-Cooked Beef Shoulder (Beef Shoulder served with Yukon Gold mashed potatoes, glazed root vegetables, and a fried egg)– Meat and potatoes, what could be special about that? Well let us tell you, this Beef Shoulder is slow cooked for 8-10 hours in veal stock. This creates tender, melt in your mouth, delectable beef. Combine this with the yolk of a fried egg and you have a rich and flavorful meal that is sure to lull you into a food coma. Not to mention the mashed potatoes were out of this world good. We can’t wait to return to Salty Sow. We noticed Lamb Burgers and Duck Fat Fries when looking over the menu. We are determined to get our hands on those. Not to mention, their amazing looking cocktail selection! Salty Sow also has a Happy Hour that runs from 4-6:30pm 7 days a week! They also have live acoustic guitar music Thursday from 6:30-9:30 pm and Friday and Saturday from 7-10pm. Have you been to Salty Sow? What do you recommend? Leave your favorites in the comments below or use the hash tag #GeekEats! We want your recommendations!